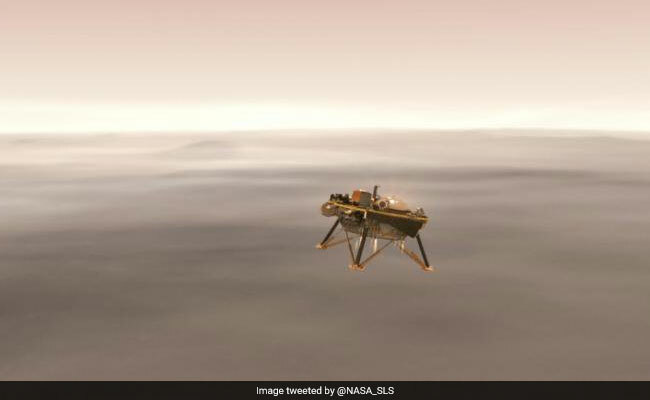 Before Mars Landing, A Nail-Biting "Six And A Half Minutes Of Terror"
"There is very little room for things to go wrong," said Rob Grover, head of the entry, descent and landing team at NASA's Jet Propulsion Laboratory in Pasadena, California. If successful, the entry, descent and landing of the Mars InSight -- designed to be the first mission to listen to the interior of another planet and reveal how rocky planets formed -- will add another success to NASA's record when it comes to sending spacecraft to Mars. - At 11:40 am Pacific time (1940 GMT), the spacecraft separates from the cruise stage that carried it to Mars. A minute later, the spacecraft makes a turn to orient itself for atmospheric entry. - At 1947 GMT the spacecraft is hurtling through space at a speed of 12,300 miles per hour (19,800 kilometers per hour) as it begins to enter Mars' atmosphere. - Two minutes later, friction with the atmosphere raises the heat shield temperature to its peak of 2,700 Fahrenheit (1,500 Celsius). This intense heat could cause temporary dropouts in radio signals. - At 1951 GMT, the parachutes deploy. Fifteen seconds later, the heat shield separates from the spacecraft. Ten seconds on, the lander's three legs deploy to get ready for touchdown. - At 1952 GMT, a radar activates to sense the distance to the ground. - At 1953 GMT, the first radar signal is expected, followed 20 second later by the spacecraft's separation from the back shell and parachute. Then, the descent engines, known as retrorockets, begin to fire. InSight's speed slows drastically, from 17 mph to a constant five mph (27 kph to eight kph) for its soft landing. - Touchdown is expected at 1954 GMT. - The first "beep" from the spacecraft's X-band radio -- indicating whether InSight survived the landing -- is scheduled for 2001 GMT. - The first image from the surface of Mars is expected at 2004 GMT. However, it's possible this image may not arrive until Tuesday. - The orbital pattern of the Mars Odyssey spacecraft, flying overhead, means NASA won't know until 0135 GMT on Tuesday if InSight's solar arrays have deployed or not. This step is crucial because the quake-sensor is powered by the Sun for its one-year mission.